Every year the 16th October is World Food Day. In January 2012 shocking statistics were published by European Union about the millions of truck loads of food wasted every year. Foodwaste.ch statistics about Switzerland say that 2 million tons of food go to waste every year in Switzerland, a third of all food produced. Statisctics about US: 33 million tons wasted in 2009. New York Yimes article That Crooked Carrot is Also Food pointed out that the solution to cure the world hunger should be through reducing waste not (just) increasing agricultural yields per hectar. The biggest loss happens in housholds and end consumer level - about 50% of all food waste. Occasionally I have more bread at home than I can eat while it is still fresh. This is a sign that soon I will be eating my long time favourite bread pudding. I store the rests of old or surplus bread in the fridge to keep it from moulding. I use this super easy recipe when I have a good handful of hard bread accumulated in my fridge. It is difficult to give exact amounts of ingredients. The amounts depend on how much old bread you have. Set the oven to 200 degrees Celsius. 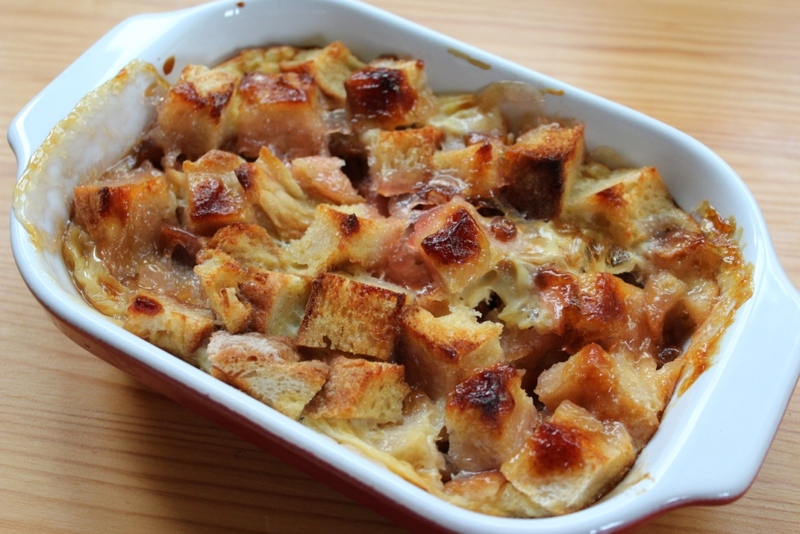 Choose a baking dish to allow 2 layers of the bread cubes. If you have a lot of bread you can layer as many as fits in the form. 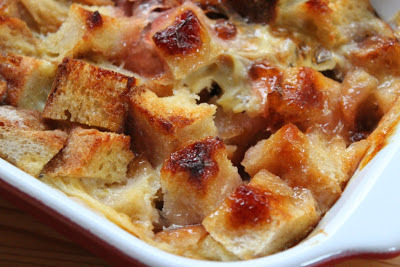 Cover the bottom of the baking dish with one layer of bread cubes. Spread jam on the bread cubes to more or less cover the bottom layer. It is impossible to cover exactly all cubes and this is not necessary. Depending on the consistency of the jam just dollop a few tablespoons of jam and spread it around a bit. It does not have to be perfect. Arrange the rest of the cubes into the baking form. If you like a sweeter dish, fill some empty spaces between the cubes with more jam. Whisk the egg(s) with a fork to combine the egg white and yolk, add the sugar and milk, mix and melt the sugar. Pour the egg-milk mixture on the bread cubes and lightly press the bread to absorb the liquid. The bottom layer should be covered with the liquid. For extra touch of luxury place 3-4 small knobs (2 cm) of butter on top of everything. Bake in the oven for 20-30 minutes until the bread on the top turns crisp and slightly browned. We used to eat this dessert with milk. I would place a portion of the bread pudding into a bowl and pour milk over it and eat. I still eat it with milk when the pudding has turned cold. It is totally OK to eat it warm. Anyway I can´t wait until it turns cold and I enjoy the crusty cubes from the top layer and the soft jammy ones from the bottom straight hot from the oven. Pairs well with a cup of coffee too.